Really nice short inverter coaster, I love all of the ride, especially the two loops . What I noticed the most, Is that we feel The G-Force really A Lot and It's Amazing, Good Ride ! What a thrill! Try finding a coaster with better pacing! Well... there are coasters that have better pacing than Vampire, but what you get here is exceptionnal! The loops and the 360 degree helix litterally crush you deep into your seat, while the super fast zero-G roll gives you that exciting and unexpected spin and the corkscrew into the mist trench is intense and refreshing, but what sold the whole thing to me was the first drop. I don't understand why people don't care so much about first drops! Most of the time, they're to me the best parts of the rides I go on, and the one on Vampire is exceptionally exciting, and for some reason, for me it felt better than on the Batman clones. It feels like flying. The speeds are blazing. And it's taken RIGHT into the first loop. Vampire leaves you with a powerful feeling of adrenalin. I could ride this thing all day, and any ride would feel as refreshing as the first one. Any park should have a B&amp;amp;amp;M invert. I love these rides. Very intense little invert like all these Batman clones. The first drop on this on was fast and had strong Gs at the bottom as usual and following that were three rapid-fire, fast, and very intense inversions; 2 loops and a barrel roll. Afterwards was an insanely quick helix that pinned me to my seat and following that was the speedy finale with 2 forceful corkscrews. This coaster definitely packs a punch. It was very very intense with too many inversions to count. It went surprisingly quick and had very tight corkscrews. The ride had some pretty decent theming as well. It was very smooth too. The first drop was pretty good twisting to the left and after that the rides shear force sucked your head against the head rest. after that its all inversion and twists and turns. This version of the Batman ride seems to be very well maintained. I found it to feel like an extremely fast and powerful ride. This was especially true at the front and back of the train, but I give the edge to the front, since the force of the ride creates a little head banging in the back row. The ride feels like you are a fighter pilot trying to shake a heat seeking missile. The manoevers are very tight and forceful. The one thing that did bug me though was the queue area. Even though the park was dead on my visit, there was no way to quickly make it from the entrance to the station. It seemed like the walk went on forever, but it made for good cardio training. BEST RIDE IVE EVER BEEN ON. It was fast, the inversions were great and abundant (there were too many to count! ), and they ALWAYS surprise you. 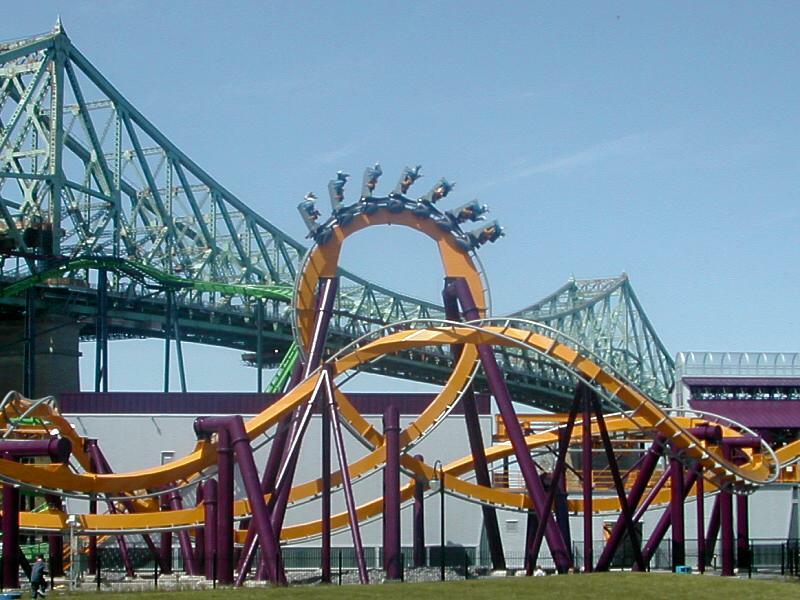 If youre in Montreal, this ride alone is worth paying the admission to LaRonde for. 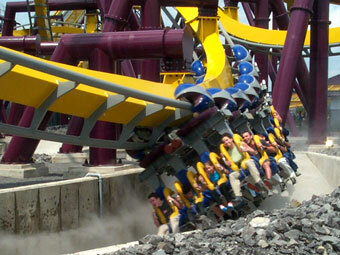 I have never ridden any of Vampires twins (Batman the Ride), but I have ridden many other inverted coasters. It is a totally different experience than the more open, park-crossing coasters like Raptor, Talon, and Great Bear. Vampire is very compact, all the track intertwined in a very small space. This creates a different thrill since, even sitting in the very front, it is virtually impossible to anticipate Vampires next maneuver -- the surprise factor adds to the thrill immensely. Raptor, Talon and Great Bear are like soaring with eagles. Vampire is like a angry bee trapped in a jar. I loved this ride. One of a few great rides at La Ronde. I tried it in the middle, back and front. The back is much better than the middle. But front is best as it has an unobstructed view. This is a mirror image of Batman the Ride of other Six Flags parks. (The first drop to the right instead of the left.) La Rondes best ride. Unless you are willing to ride alone - If you use a speed pass you must sit in the middle. If you are willing to ride alone you can wait for a trio to take row #1 or row #7 and use a speed pass.